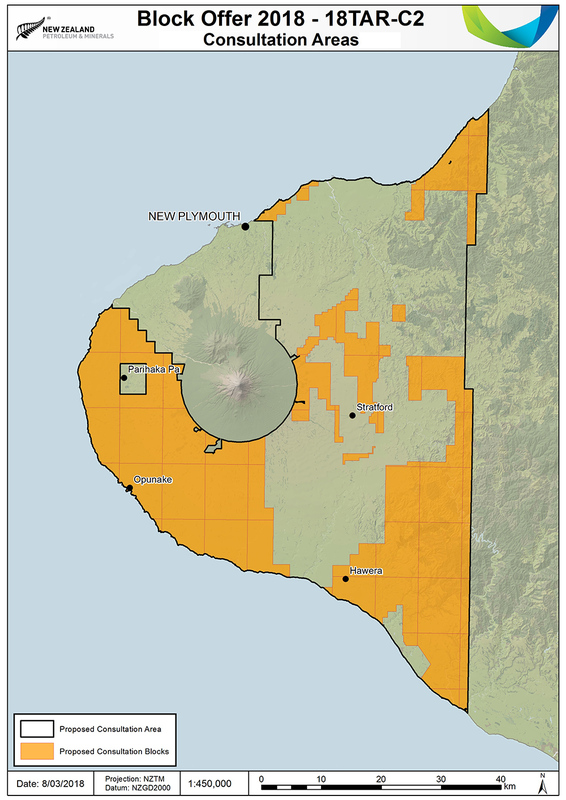 The proposed release area is restricted to the onshore Taranaki Basin, covering 1,703 square kilometres. The area for consultation includes a small amount of conservation land. Land listed under Schedule 4 of the Crown Minerals Act and Parihaka Pā are excluded from the proposed area. The purpose of the consultation is to identify areas of sensitivity or significance that the Minister needs to be aware of. This could include sites that might need to be protected for their cultural, social or spiritual significance. Submitters can ask the Minister to remove these blocks or areas within blocks, or put conditions on any permits over certain areas to protect them. Once consultation is complete, New Zealand Petroleum and Minerals (NZP&M) will provide advice to the Minister who will decide the final area to be released for tender. The tender is expected to open in August 2018.